Tatiana August-Schmidt graduated with honors and high distinction as a Regents’ and Chancellor’s Scholar from the University of California, Berkeley in 2014. Tatiana majored in history and wrote two theses on the post-World War II Anglo-American reeducation program in West Germany. 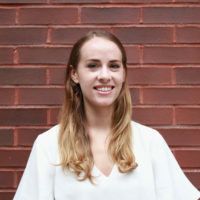 After graduation, Tatiana moved to London and worked for the Institute for Public Policy Research (IPPR) on migration, housing, education, and labor policy. While at IPPR, Tatiana worked closely on shaping the government’s response to the ongoing refugee crisis. On return to the United States, Tatiana externed for a federal judge in California. Tatiana's interests include international human rights, immigration, and environmental justice.